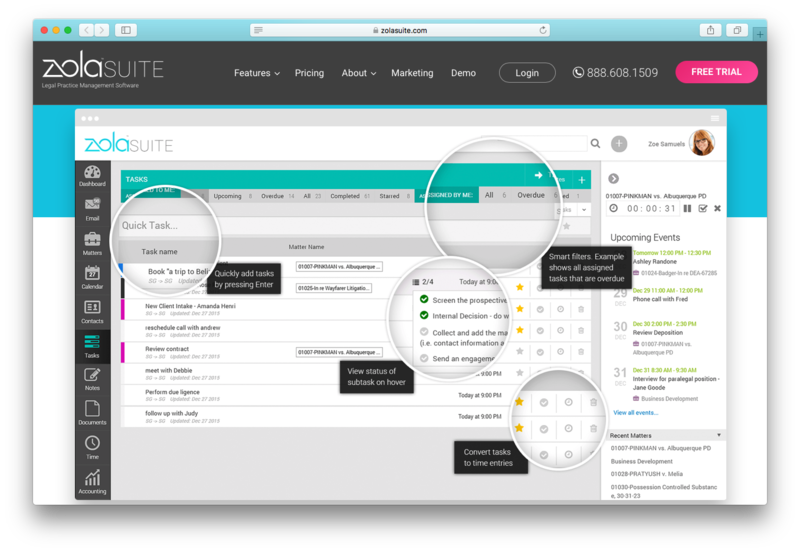 "Zola Suite provides next generation, cloud-based practice management software to mid-sized and large law firms." Zola Suite scored 79/100 in the Legal category. This is based on user satisfaction (68/100), press buzz (38/100), recent user trends (rising), and other relevant information on Zola Suite gathered from around the web. Whether your law firm is small or big doesn’t matter because there will really be times when everything will become difficult to handle. There are just too many things to do aside from win cases. This is where the cloud-based practice management software solutions like Zola Suite come in. Created specifically for solo, small, and mid-sized law firms, this full-featured platform is a good software solution for improved efficiency, accountability, delegation, and productivity. This tool has been clearly designed as a one-stop shop for legal firms that put a premium on integrating the essential professional needs of the business. It allows law firms to allocate the same amount of attention and action to all aspects of the practice even when you are out meeting a client or battling it out in court. Developed by lawyer and entrepreneur, Fred Cohen of Zola Media, this practice management tool has been designed to change the way you run (and look at) your business, especially if you are one of the many who spends hours upon hours working on an Excel spreadsheet ensuring all core aspects are covered. If you want maximum productivity, efficiency, and accountability, a new generation, single platform like Zola Suite is a good choice. There are three ways Zola works for solo, small, and mid-sized law firms. Primarily, according to the developers, Zola provides the right tools to law firms. They opine that with the right tools, everything that needs to be covered and taken care of will be given proper attention. Second, Zola helps law firms to improve—not just in one aspect but in all the places where improvement is necessary. Third, the Zola Suite practice management software teaches and encourages law firms to use a systematic approach. If a system is in place and it is used to its full potential, there is no reason why a business will not be propelled to the top. There is no reason why a law firm will not satisfy clients’ needs. 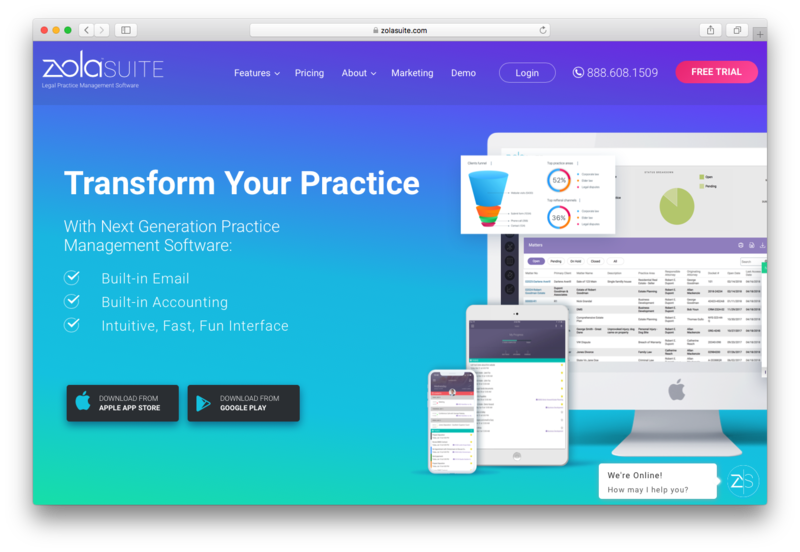 With a 360° new generation, integrated practice management software, your law firm gets to be more efficient and, in the process, become more profitable. In addition, Zola works by helping law firms easily organize emails via its built-in email functionality. It is the only cloud-based practice management software solution that has one. This built-in email service is essential in facilitating the proper organization of emails so there is assurance that nothing is sent to the wrong person, company, or entity. Zola makes communication an easy process for law firms. In addition, Zola works by allowing law firms to share documents using an integrated client portal called Caseway. This is a 100% guaranteed safe, interception-secure, and bank-level encryption bearing portal. As such, firms are sure that even the most important, most privileged documents and information are kept safe. In more specific terms, Zola works because it is built as one complete platform so it can make a bevy of law firm tasks easier. For example, when you get to the dashboard, you’ll find three windows that show a calendar, email, some tasks, and buttons you need to use to navigate to other screens. Additionally, it offers tutorials, but these aren’t that necessary because all you need to do is find the Matters button or command and then click on it and the plus sign. In a matter of seconds, you are all set and good to go. From then on, you’ll find out how easy it is to navigate through the system. All you need to do is follow instructions and click on the right buttons. Some of the things to watch out for are the tasks function with features like a workflow/subtask template and colorful options features, the drop-down menu in the calendar and its full accounting features, which means you can do away with cumbersome QuickBooks and Excel sheets. Overall, Zola Suite does a lot of essential and first-class work for solo, small, and mid-sized law firms. So, as previously mentioned, it is a one-stop-shop for firms that want to bring organization, efficiency, and accountability to a new level. This feature is one of the things that make Zola Suite stand out from the rest of the pack. Integrating three of the most important features—email, calendar, and tasks—is equivalent to offering the best convenience any business can have. Having these three together and visible in one place eschews the need for you to open a lot of windows or pages; all you need to do is click on any of the icons and what you need will immediately pop on screen. Once you click on the email icon, you will be taken directly to an email window that features all the email capabilities you need. What’s unique about this is the fact that you get your actual email account, not an email that’s spoofed, which is often saved in the junk folder. In addition, Zola allows you to turn emails into tasks that can then be associated with a Matter and passed on to another hard-working member of the team. It allows you to choose from six colors, indicate the due time or date of a particular task, and has a status option that is creatively termed Waiting on Someone Else. It’s like an all-in-one task dashboard. Joining a conference or convention of lawyers soon? Zola Suite can help you add some important names to your network. All you need to do is secure a business card from your new contacts and Zola will scan it. It’s an app that’s perfect for someone who is always mobile. This practice management software is compatible with both iOS and Android smartphones so you can be productive even when on-the-go, and no matter what your OS is. Likewise, the software comes with native iOS and Android apps like calendar events, task management, timekeeping, document scanning, fingerprint recognition, and, as mentioned earlier, business card scanning. All these benefits offer convenience and a surefire way to better organization, efficiency, and productivity. Zola Suite has three pricing packages for you to choose from: Solo, Team, and Enterprise. Solo is for solo accounts while Team is for law firms that have two or more users. Enterprise, on the other hand, is for law firms that have five or more users. Annual rates are $49 per month for Solo.It is $58 per month per attorney and $48 per month per non-attorney for Team. Rates for the Enterprise package are available at discount pricing, but you have to contact a representative from Zola Suite. Monthly rates are $59 per month for Solo accounts and $68 per month per attorney and $58 per month per non-attorney staff for Team accounts. Again, for discounted Enterprise pricing, get in touch with Zola Suite. A free trial is available if you want to make sure that you chose the right pricing package for your law firm. Contact a Zola Suite customer service representative to ask about other premium solutions offered by the company. Zola Suite practice management software is the most convenient way to ensure your law firm’s efficiency and productivity. Everything that you need to keep things in their rightful places and propel your business to the top of the success ladder is there—all in one platform that’s simple and easy to use. If you believe that Zola is the right solution for your law firm—that it is what you need to finally get the spotlight to shine on your business—then you need to at least consider this software solution. What are some applications Zola Suite is commonly used in tandem with? Does Zola Suite offer multi-user capability (e.g. teams)? What platforms does Zola Suite support? Does Zola Suite offer guides, tutorials and or customer support? Does Zola Suite integrate with any other apps? Who are the main user groups of Zola Suite? What is Zola Suite generally used for? Does Zola Suite offer an API?